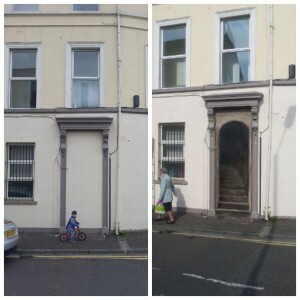 Steadyhanded » When a blocked doorway becomes a stairwell! Here is a recent piece of street art I completed, close to where I live in Holywood, Co Down. Every time I went out for a walk , this blocked up doorway would nearly grab me by the scruff of the neck and scream to be painted!